Liat Yossifor is presenting a solo exhibition from February 11 to March 12 at Ameringer McEnery Yohe Gallery. Liat Yossifor's calm yet dynamic grey works convey the very language of painting through every decision, hesitation and fearless swipe, scrape or whisper-soft marking. I started painting very young, and went to an arts school in Israel prior to coming to the States as a teenager. My grandmother was a painter later in life (after retiring from teaching) and I used to go to her studio in the heart of Tel Aviv and paint with her. I remember an enormous Max Ernst book on her coffee table that gave me nightmares, and thinking that painting is powerful to do so. This will be your third exhibition at the gallery. Your last exhibition titled, Eight Movement, was compared to musical works, for example Bach’s Six Suites for Unaccompanied Cello. What are some of the concepts in your upcoming exhibition? The musical specificity was a writer's interpretation, not my intention. But, the comparison to both music and dance was relevant for the previous show. Eight Movements was composed of time-based performative large scale paintings, where bodily exertion was primary to the process. 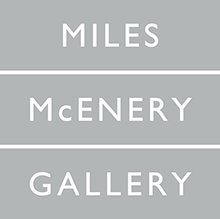 This upcoming show is of small works that are object-like, figurative, almost clay-like. 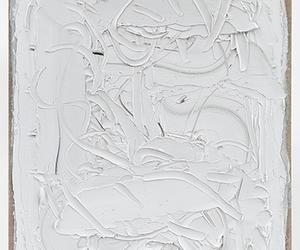 In this format, the raised surface (of thick paint) speaks directly to the physicality of paint, and the pictorial line in it (made of lines and incisions) has to work itself in relationship to the physical. This part-picture, part-sculpture state is a kind of a double life for these paintings, which is a state that always exists in painting but on which I am placing a magnifying glass. I like to take one or two concepts from the language of painting and use a minimal language to dig deep into it. What was the process for creating these works? For these small works, I did a painting a day, and I scraped most of what I made in order to arrive at a painting that works. Each painting is also many different compositions that were erased during the process. The hardest part of the process is searching for a moment of interest between the pictorial and the sculptural as I discussed above. It's like looking for the painting's own visual logic, one work at a time.